Bridges 2019 @ Anton Bruckner Private University: Formal Music Night - "ASR - algorithmic and stochastic resonance"
Bridges 2019's Music Night features a concert of algorithmic and stochastic compositions, improvisations and realtime processing organised by the Computer Music Studio of the Institute of Composition, Conducting and Computer Music in cooperation with the Institute of Keyboard Instruments at the ABPU. The Anton Bruckner Private University is an open, innovative centre for the arts, where the performers and teachers of tomorrow receive an individualized education in music, drama and dance. 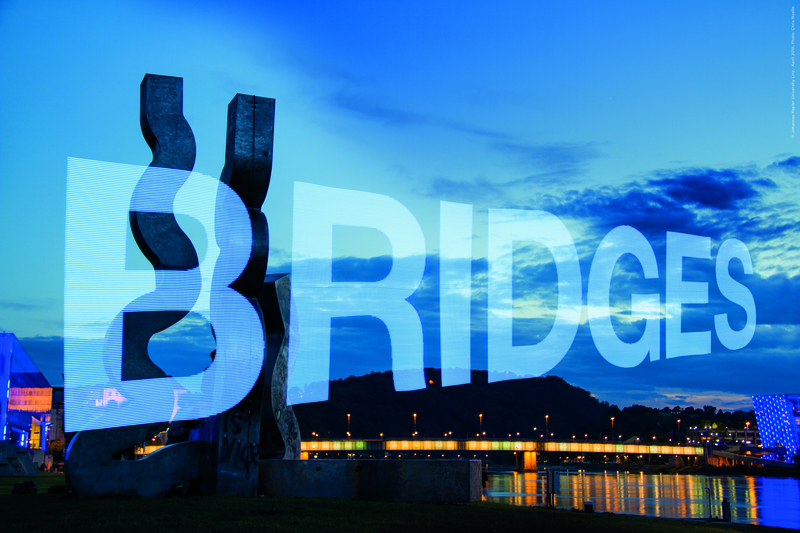 As one of the six Austrian universities for music and drama, and one of the four universities in Linz, the UNESCO City of Media Arts, the Bruckner University sees its role both as a training ground for performing, teaching and academic research, and as an important agent in the development and communication of the arts. 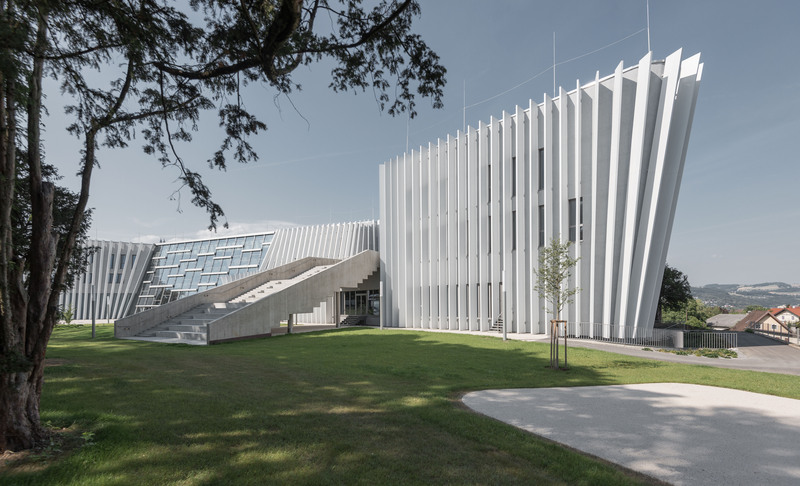 The new building of the Bruckner University impresses with its striking architecture and creates the ideal environment for many-facetted encounters with music, drama and dance. The range of courses offered by the Bruckner University include performance and teaching degrees in the classical instrumental categories and in Vocal Studies, Early Music, jazz, composition, contemporary dance, drama, music promotion and communication and elementary music education. All courses of study are completed with the academic degrees “Bachelor of Arts” (BA) and “Master of Arts” (MA). Aspiring composers and their new musical works have a particular value for our young and innovative music university. Their creative potential is developed and promoted by the interaction between the study areas Composition, Conducting, Improvisation and Ensemble playing. sees it self as a competency center for electroacustic music, computer music and intermedia arts in the region of Linz and Upper Austria. The aim was to facilitate research and performance of electro accoustic compositions as well as international exchange in teaching and production with other highly developed national and international music studios. It is strongly connected and focus on cooperations regional, national and international. The Sonic Lab is an intermedial computer music concert hall with a peripheral loudspeaker system and was initiated for the ABPU by Andreas Weixler between 2005 and 2015 in conjunction with the studios and facilities of the Computer Musik Studios CMS with in the new building opened 2015. The Computer Music Studio was founded in 1995 as SAMT Studio for Advanced Music and Media Technology by DI Adelhard Roidinger and the former Rector of the Bruckner Conservatory, Mr. Hans Maria Kneihs with Softwarepark Hagenberg. Since 2008 Ao.Univ.Prof. Andreas Weixler was directing the university studio, at the same time the studio was renamed by a institute decision in CMS - Computer Music Studio. From 2005 to 2015, Andreas Weixler and Se-Lien Chuang developed concepts for the CMS studios, teaching and production studio, teaching and ancillary rooms for the construction of the ABPU and an intermedial, multi-channel computer concert hall, the Sonic Lab. The Sonic Lab is an intermedial computer music concert hall with periphonic loudspeaker system and was initiated jointly with the studios and premises of the computer music studio CMS for the Anton Bruckner Private University by Andreas Weixler in the period 2005-2015 to research and perform electroacoustic composition and computer music as well as for international exchange to enable teaching and production with other advanced computer music studios nationally and internationally. In 2015 Univ. Prof. Volkmar Klien became appointed Professor of Computer Music and Electroacoustic Composition and director of the Institute of Composition, Conducting and Computer Music. The Keyboard Instrument Institute is one of the central institutes of the Anton Bruckner Private University. It has a dedicated team of distinguished teachers who offer students keyboard-instrument training using the most up-to-date methods. The basic training comprises the principal study – piano, piano chamber music, accordion, organ and harpsichord – as well as all keyboard related subjects. Figured bass, organ improvisation, principles of organ building. Chamber music and vocal accompaniment also play a significant role in the studies. A further important aspect of the institute‘s profile is music pedagogy, in co-operation with the local music school system (Musikschulwerk). Additional activities such as master classes, projects involving students from various classes and exchange concerts, offer students a stimulating environment, enabling them to assess their skills in comparison with other musicians. We set great store by close cooperation with other institutes and departments within the university, to promote innovative creative ideas. "This piece was composed in 2018 as a part of an Erasmus agreement between the University of Music and Performing Arts in Graz and The Danish National School of Performing Arts and directly written to Milos Katanic. The title indicates that the music is inspired by dance and also science. Friedrich Paschen was a German physicist well known for the discovering of the Paschen series in 1908, which is one of the series of the hydrogen spectral lines. The Danish physicist Klaus Mølmer has composed a list of the hydrogen series as frequencies, which by transpositions can be used as musical scales. The 6 first scales are based on the Lyman, Balmer, Paschen, Brackett, Pfund and Humphrey series. In this piece, the Brackett and the Pfund “scales” are used and it is the first piece using two different series. This quantum composing technique was developed 2015-2018 in the international artistic research project called Quantum Music, which was supported by Creative Europe and the Danish Arts Foundation. 1) A very rhythmical section aggressively presenting the Brackett scale. First, one note alone then slowly adding the other notes of the scale. 2) A lyrical theme using the tonal aspect of the Quantum series. In the development section, the material is mixed and it ends up this way, that the lyrical theme takes over the rhythmical shape of the first material. The mood of the music expresses an atmosphere of both mechanical movements and of pastoral harmony. The sound of quantum mechanics."